Guidelines, instructional movies, equipment and checklistes for a sucessfully treatment. The new guidelines of the European Resuscitation Council (ERC) was published on October 15, 2015 and describes the science-based implementation and delivery of cardiopulmonary resuscitation (CPR). scoop stretcher; navy-basket stretcher or German Maritime Rescue Services-salvage stretcher. oxygen demand-valve with oxygen tube. Bag valve mask with flexible mask. ACD-Thorax-Suction Device (ACD-CPR) System Dr. Block. 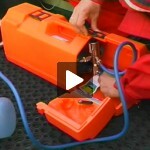 Combitube®-SARRRAH®-Kit: for resuscitation during hypothermia. No active warm up (except in shivering). As soon as possible inform suitable destination hospital of patient's critical condition!